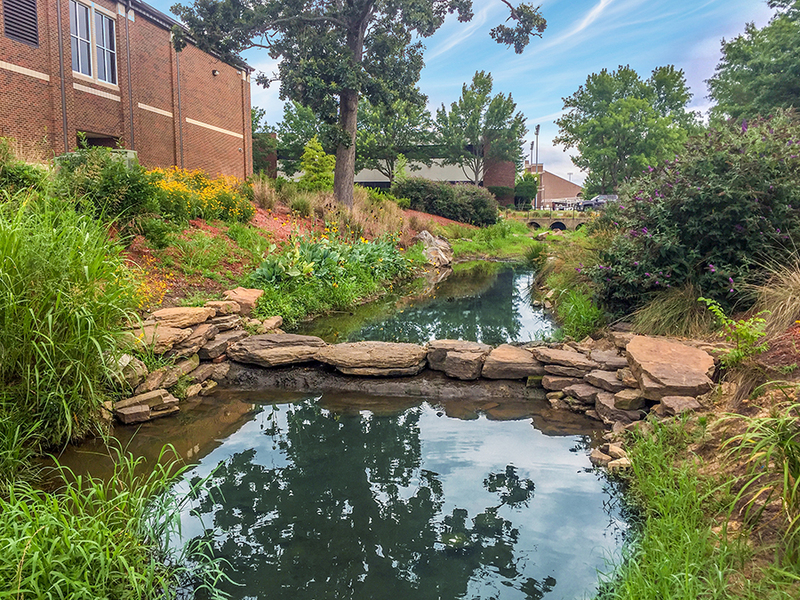 Whether you call it a ditch, drainage channel, watercourse, or canal, facilities that carry storm water runoff are not usually thought of as anything more than a functional necessity. These intermittent streams, whether manmade or naturally occurring, are often eyesores to a campus or municipality and can be maintenance headaches to grounds keeping crews. In past years, the prevailing school of thought has been to enclose such channels to get them out of sight (and out of mind). Cities have constructed roads, parking lots, and even buildings over reinforced box culverts. However, this option can be very expensive, and can create maintenance issues of its own. Other options to minimize maintenance problems have included the placement of riprap to control or eliminate bank erosion and limit the amount of invasive vegetation that has to be cut on a routine basis. Again, these options are usually unsightly and are not very maintenance friendly. A less expensive alternative to these trends is the low impact design of open channels that are more appealing to the eye, and can add to the outdoor greenspace beauty of a community. This is accomplished by the deliberate placement of stones, small waterfalls, native grasses, gravel beaches, and flowering plant material to create an aesthetically appealing landscape. In essence, this process can turn the perception of an obstacle into an amenity for the campus or city. Typically less costly than the construction of concrete box culverts and channels. This approach can be utilized in the design of new drainage channels, improvements to existing drainage channels, or the restoration of natural streams and swales that have been neglected and have suffered erosion issues due to partial blockage by debris or sedimentation buildup. There are many factors to consider when using this approach in design. Channels that provide drainage from small basins or low lying areas can be relatively simple to design. However, larger basins may require hydrologic and hydraulic studies to determine minimum capacities, high water marks, and water velocity during peak rain events. Special consideration also must be given to areas that are in a FEMA regulated floodplain or floodway to ensure that properties are not negatively impacted by the channel improvements. 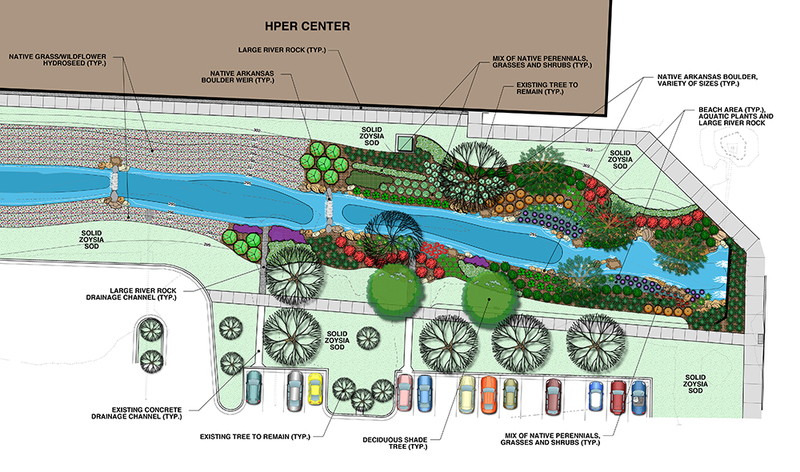 In addition to the actual channel rehabilitation, other amenities can be added along the bank of the watercourse to enhance the outdoor experience such as pedestrian and bicycle trails, sitting benches, and memorial or reflective gardens. Many communities are planning and constructing their trail networks along these “greenways” as a way to utilize the space in floodplains for public recreation and commuting purposes. Using the architectural adage of “form follows function,” a low impact designed creek or channel will both address drainage issues, while at the same time, becoming a unique site amenity. The added benefit is the ease of maintenance that comes with this more natural approach. The outcome is a soft engineering solution that is better for the environment and better for the community.